If you're reading this, someone knows about it. They know how you got here and they'll follow where you go next. They're keeping tabs on what you'll do on the Internet today. Every day. The U.N. declared the Internet to be a human right but, given the surveillance taking place online through various backdoor channels, that is essentially a right to be watched. If that doesn't bother you, then no worries. If it does, then here's something you can do about it. 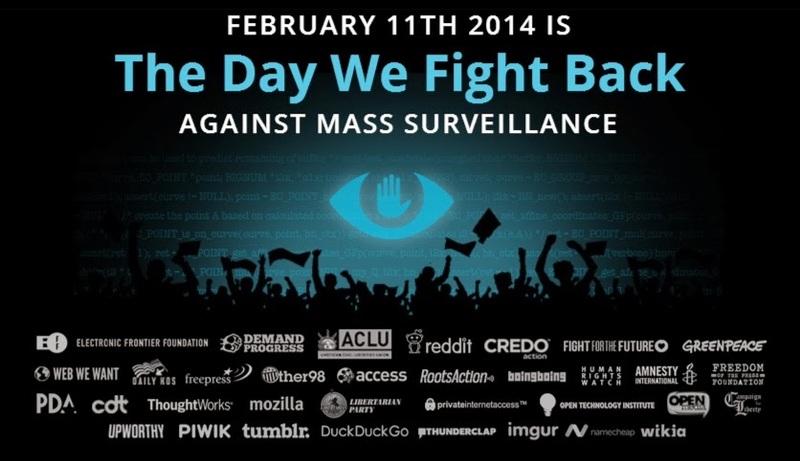 Tomorrow, February 11, 2014 is a day of Internet disturbance. You can take part by signing up, spreading the message and even adding a snippet of code to your site that will add a banner and a call to action for anyone who comes to visit on Feb. 11th. What will the banner say? US: Thousands of websites will host banners urging people to call/email Congress. We'll ask legislators to oppose the FISA Improvements Act, support the USA Freedom Act, and enact protections for non-Americans. International: Visitors will be asked to urge appropriate targets to institute privacy protections. If you're interested in taking part, head to The DayWeFightBack.org and grab the code, add it to your template, register your site and spread the message. It's easy and it's simple and it's important. You'll see the banner here tomorrow. Hopefully, I'll see it on your site too.